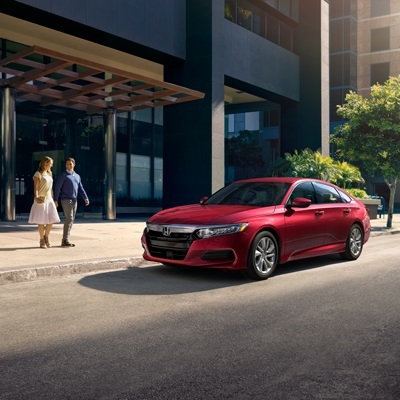 The 2019 Honda Accord is highly ranked among midsize cars, thanks to its family-oriented design and solid performance, along with energetic engines and a spacious interior. Drivers in Marlton, Cherry Hill, and Mount Laurel can find out more about the 2019 Accord with our in-depth model review. The 2019 Honda Accord seats up to five people in the front and rear seats. Both rows offer plenty of head- and legroom, even for adults, ensuring long-distance comfort. High-quality cloth upholstery is standard, but leather-trimmed seating, heated seating, and power-adjustable front seats are available to enhance the interior comfort. The Accord offers above-average cargo space in its 16.7-cubic-foot trunk. This is more than enough space for shopping bags, groceries, and luggage, all which fits nicely in the regularly shaped trunk. The Accord comes with a 192-horsepower turbocharged 1.5-liter four-cylinder engine mated to a continuously variable transmission. This is ample capability for your daily driving needs, but there’s also a 2.0-liter, 252-horsepower turbo-four for those looking for more performance. This engine mates to a 10-speed automatic transmission that extracts every bit of power from this performance engine. A six-speed manual transmission is also available. Regardless of engine, the Honda Accord can tackle the curving roads without compromising a smooth, comfortable ride quality. Several driving modes are available, giving you the option to fine tune your driving experience. The 2019 Honda Accord Sport model is on the offer as well, which is the performance-minded option and includes enhancements like a manual transmission, a rear spoiler, sport pedals, and the upgraded engine. The Accord comes standard with an infotainment system with a 7-inch display screen, a four-speaker stereo, Bluetooth® connectivity, and a USB port. Plenty of upscale technology features are available as upgrades, such as an 8-inch touchscreen, HD Radio™, Android Auto™ and Apple CarPlay™ smartphone integration, and an eight-speaker or 10-speaker sound system. The infotainment system is one of the best on the market as well, boasting an intuitive layout, a responsive touchscreen, and plenty of entertainment capabilities. Rear Cross-Traffic Alert and Blind Spot Monitoring are available as additional upgrades. These features help you stay aware of the area around your vehicle and alert you to potential crashes, so you can take preventative measures to avoid them. The 2019 Accord is an excellent option for a practical, family-oriented sedan, though it’s available with plenty of exciting options to adapt it to your needs. Whether you want a value-packed commuter, a family road-tripper, or a performance sedan, there’s an Accord model for you. Drivers in Marlton, Cherry Hill, and Mount Laurel can find out all the 2019 Honda Accord has to offer when they visit Burns Honda. Call or stop by our dealership today to learn more about the new Accord and schedule your test drive!